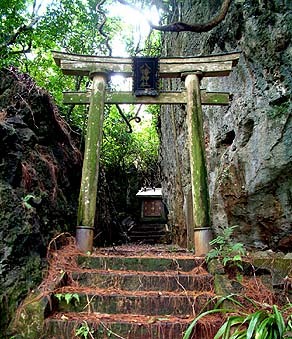 Entrance way to the Hachiman Shinto Shrine, on the Kagman side of Saipan. 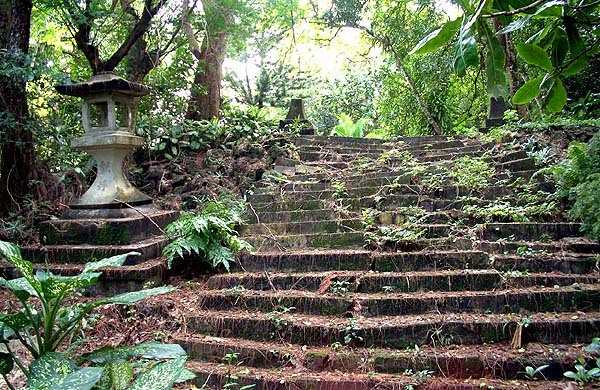 Though mostly in ruins, the shrine has been recently brought back into operation by Japanese. “I remember going to Japanese school,” Jesus recounts. “During this school time, we didn’t have a formal education in the language of Japanese, except a lot of practical study in agriculture. The language was strictly Japanese. We were not allowed to use Chamorro language. “They weren’t very strict on the lessons in Japanese simply because they were not interested in how well we would do in school. They’re more interested in how well we learned the trades and the practical knowledge of agriculture. 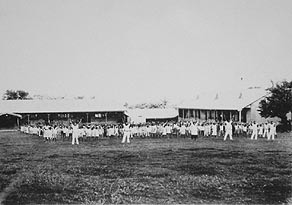 School children exercising outside a school, 1930s. Photograph courtesy of the CNMI Historic Preservation Office. The Hachiman Shrine is tucked in a cleft in the rock. 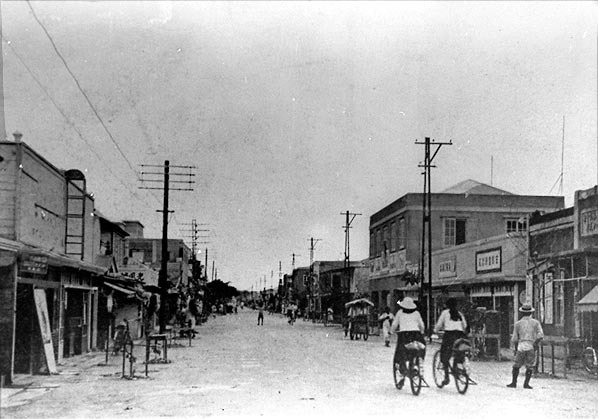 Street scene, Garapan village, 1930s. Photograph courtesy of the CNMI Historic Preservation Office. “Local people were making a lot of money, as they do now, by leasing their lands,” Scott continues. “The Japanese leased farm lands and they also leased houses. If you had a nice house lot in Garapan, you might consider leasing it out and moving to your farm and living off the proceeds. So a lot of people made pretty good money just on leasing arrangements. Consequently the standard of living was much higher than it was on Guam at the time. “I think in the 1930s when land was starting to get scarce, the Japanese started to enter into some questionable practices. Rarely was there just outright kicking people out, but they had ways of forcing you. If they wanted your land and you weren’t being cooperative, they had ways of letting you know that you should move, and you normally did." “The people now remember the Japanese times as being prosperous. Nonetheless, at the end of World War II there was a lot of resentment, because there had been a real social structure. It was the Japanese, then the Okinawans, the Koreans, and the Chamorros and Carolinians. The locals had a collective name. They were tomin, islanders.' It was kind of a derogatory term that the Japanese used. The Japanese built a modern hospital. 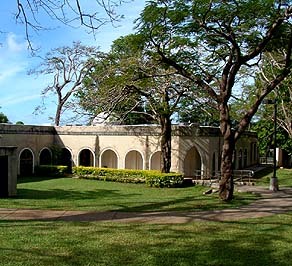 One of the few remaining buildings from that era, it now houses the CNMI Museum. 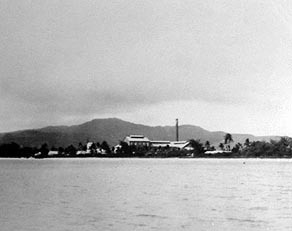 The sugar factory dominated the waterfront of Chalan Kanoa. Photograph courtesy of the CNMI Historic Preservation Office. “My mom was working to clean sugar cane leaves from the dry stalks,” Rosa Castro remembers, “because all around Saipan, there was tapioca and sugar cane. We had a factory for tapioca down there on Lower Base. And the factory for the sugar was down at Mt. Carmel Church. So all the island of Saipan was tapioca and sugar cane. They were the main products produced by the Japanese. “When the Japanese knew the Americans were going to be here, they took all the men. They were put in a camp by the Japanese, as the invasion was approaching, as labor to build what they needed built. Only women and small children were left in the village. That’s when my mom went out helping Japanese to clean the tapioca leaves or sugar cane leaves, for only 3 yen, sannen. And we’d go to Garapan. We’d buy one pound of rice, we buy other fish, maybe like salmon, a kind of pickled or salted fish." 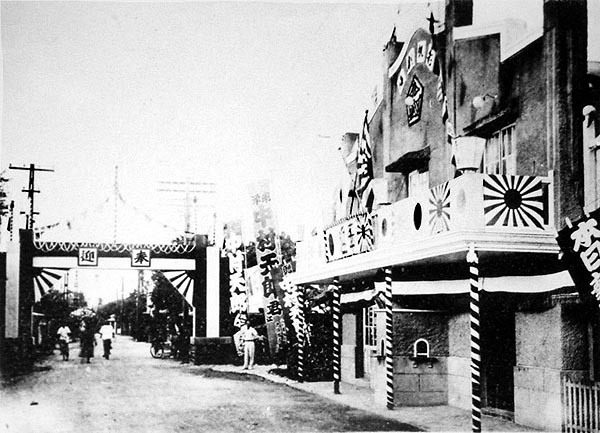 Another Garapan street scene from the 1930s. Photograph courtesy of the CNMI Historic Preservation Office. “A lot of people of our parents' generation, they loved the Japanese era,” Noel adds. “The Japanese leased our people’s land, and the locals had money to spend—maybe they wouldn’t get rich but that’s okay. But the Japanese, you know, they did a lot of good things. They really built Saipan into a modern place and they had a post office, retail shops, and of course the ships coming in and out. 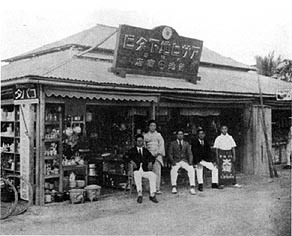 Japanese-owned Kiyuchi store. Photograph from Farrell (1991). 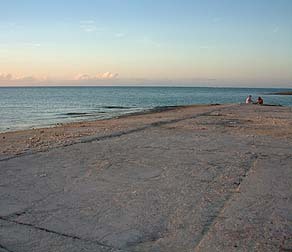 This seaplane ramp was one of many harbor developments of the Japanese period. “I don’t think it was viewed as favorably as the German period,” Scott surmises. “How could you have it more favorable than the German period? Then, you pretty much had the best of both worlds. There was just enough organization and money coming in, yet with a lot of personal freedom. "The Germans let you know what you were supposed to do. You had to pay your tax and you had to do this and you had to report if you owned a cow or something, but for the most part, you were left to do your own thing. It was at a time when people could live a subsistence lifestyle and live very comfortably. The land was so rich at that time." The fortunes of the Japanese would change dramatically with the advent of the Second World War in the Northern Mariana Islands. This and other changes in the 20th century are recalled in the Memories chapter.